Details on the work of this charitable organisation can be found on their website. The Community Car Scheme helps people who have difficulty using public transport or who must travel where there is no public transport available. The most common types of journey requested are to get to health and social care related appointments. The Scheme is supported by volunteers using their own cars who are paid a mileage allowance. Passengers are charged a contribution towards the drivers’ expenses. 48 hours notice of journey bookings is required. The Community Visiting Scheme uses volunteers to visit people in their own home and to provide a range of voluntary help. This may involve giving family or other carers a break from their caring responsibilities or just calling in to see someone who might benefit from such a visit. The visits are normally weekly or fortnightly for about an hour or two at a time to suit both the volunteer and the persons being visited. This is a very well established day centre based in Springhill Court on Manor Road in Easingwold. It is for older people and is open Mondays, Tuesdays, Wednesdays and Fridays from 9.30am to 4.00pm. The day centre offers friendly support, entertainment, games and trips out. Members usually choose to have lunch at the day centre. Easingwold and District Stroke Club is for people of any age who have been affected by a stroke. Relatives and friends are very welcome to attend. 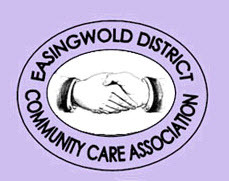 The Club is held on the third Wednesday of each month at Springhill Court, Manor Road, Easingwold from 2.00pm to 4.00pm. Activities include local outings during Spring and Summer and visiting guests offering an insight on a variety of interesting and enjoyable subjects. There is also the support and friendship from all group members, volunteers and organisers. The Crossword Club meets every Monday, except bank holidays, between 10.30am and 12.30pm at EDCCA Offices, Police House, Church Hill, Easingwold. A small friendly group come together to complete cryptic crosswords. The group is volunteer led by Clare Chapman who also encourages the less experienced to undertake more difficult clues whilst enjoying a convivial atmosphere. Tea and coffee is available. The group meets on the first Monday of every month, except Bank Holidays between 1.30pm and 3.30pm at Springhill Court, Manor Road, Easingwold. Come along for friendship and support worthy causes knitting for charity.